People are becoming more and more conscious of the “three bottom lines” to a business – whether as someone running a business or making a career choice. 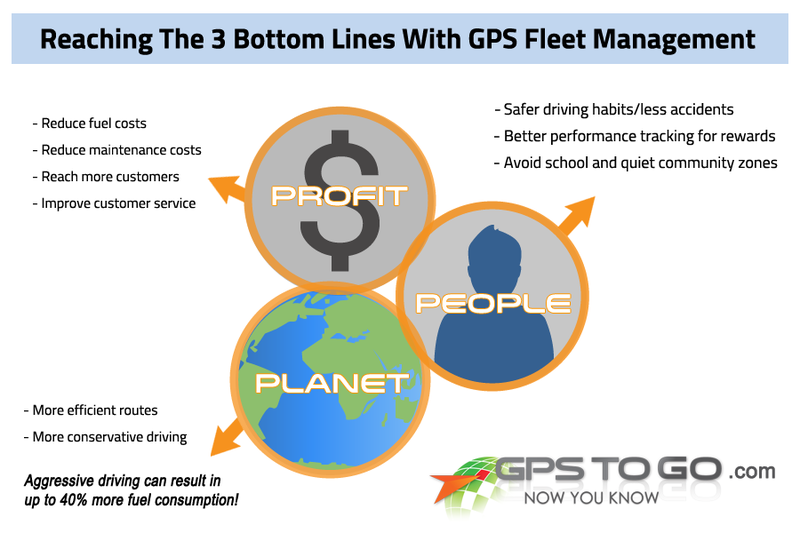 In this post you will see how fleet management can help you achieve these 3 bottom lines. There’s not many products out there that have such a direct link to improving each of these three bottom lines, so it’s something we’re particularly proud of. What are the 3 bottom lines? Profit: like we all know well, one of the main reasons for a business is to make a profit. Planet: a business shouldn’t have a sole goal of making a profit with disregard to the planet. Most people realize nowadays that we need to start being more reticent of our impact to the environment and take on more sustainable business practices. People: a business is only as strong as the people behind it, and our end-to-end fleet tracking and management system can help create a transparent and fair work environment while being considerate to the community. Reduce mileage and fuel use between stops via more efficient routing. Reduce vehicle wear & tear and maintenance costs via driver training for safer and more conservative driving habits. Reach more customers in a day via more efficient and smarter dispatching. Improve customer satisfaction via better ETA’s and communication with customers. Reduce chances of theft and off-hours usage of vehicles. And many more profit benefits. Until we all start driving electric vehicles or discover some other sustainable fuel source, the most we can do is be conservative and efficient in driving. Through the fleet management software, you can automatically create the most efficient routes for all your drivers – even while considering live traffic analysis. This means you can get more work done with less travel time – and less fuel consumption. Plus, with all the driver training abilities through the fleet management software, like in-vehicle driver alerts for things like harsh braking or jackrabbit starts, you can make a significant improvement to how your drivers use their vehicles on the road. You might be surprised to know that aggressive driving can result in up to 40% more fuel consumption! Even just reducing the amount of idle time a driver has can make a big difference. The Geotab fleet management software also keeps track of all your vehicle maintenance and engine status, so that you always have well-tuned vehicles and fix any issues before they become problems. Ensure drivers are practicing safe and conservative driving habits, thus improving their own safety and reducing chances of an accident. Better reward employees for good performance through the exceptionally accurate tracking of their activities in the fleet management software. Ensure the vehicles they are driving are well-tuned and up-to-date on maintenance via the convenient notifications in your fleet management software. Create zones on your service area maps to prevent (or notify) drivers from entering sensitive areas like school zones or quiet neighborhoods, thus also being considerate to the people of the community. As you can see, fleet tracking is much more than just improving the profit of a business. It also helps create a safer and more rewarding workplace for employees, and reduces your carbon footprint all while making your business better. If you’re interested in seeing more how our GPS fleet tracking system can make a triple-difference to your business, request a quote online or sign up for one of our web demos!